After a morning finishing one book, starting another, and sending some emails I should have sent months ago it was time to get back on the bike and pedal around in a surprisingly beautiful day. I headed down the hill to the Inner Harbor with an eye toward redeeming a coupon for a trip through the historic ships parked there. Well, that coupon expired in May, so I decided to just wander around to see what I could see. First stop: Harborplace. I’ve never been in there, because why, but today I decided to go check out the McCormick Spice store. I pass their windows all the time and wonder: who would open a store in honor of grocery store spices? Totally baffling, but there you go–the mall also boasts a Bubba Gump store and a Hooters store, so I guess there’s a market for anything? Anyway, I did a turn around the store, played several interactive games (the flavors of colonial conquest! what’s your flavorprint! ), watched a woman alert her husband to the 20% off grill tools sale, and then took my leave, still confused about how a store like that stays in business. I grabbed my bike from the new Harborplace bike rack–thank you!–and walked toward the Convention Center to see if anything was going on there. 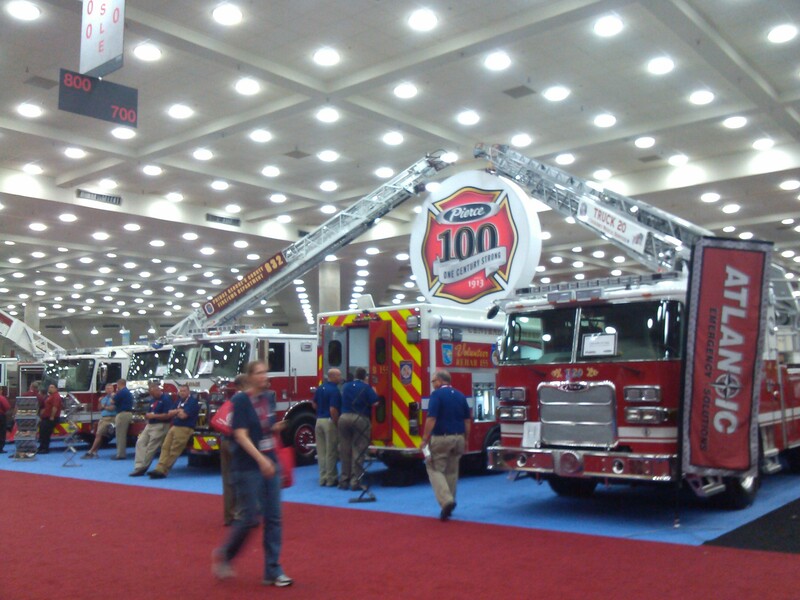 As luck would have it, there was some sort of firefighting convention so I locked up my bike and walked onto the trade floor like I belonged there so I wouldn’t get stopped and asked for the badge I didn’t have. Once inside it was all firefighting, as promised. There were these trucks on display with all shine and impressive organization, a zillion versions of the Jaws of Life, several Christian firefighting fellowship groups, a place selling Confederate flag beer steins, firefighting uniforms hanging on racks like it was Macy’s or something, a newfangled berm system to prevent flooding, Sparky the Fire Safety Robot Dog with his animatronic jaw, and on and on and on. Many of the booths were staffed by young, skinny minny pretty model types, a job option I hadn’t considered. Everyone but me was in an outfit proclaiming their firehouse or their familial relationship with a firefighter, and yet again I was reminded that people are truly, madly, deeply embedded in worlds I know nothing about, thank goodness, because I love the part where there are so many ways to live a life, and sometimes everybody living one life gets to meet up and just revel in it, which they were doing, as much as it was also just another professional conference. I can certainly do without the Confederacy crap, though. I finished my rounds and then it was time to head back up the hill, change into a dress and heels, and head back down the hill to meet A., K., N., and friends for a night at the museum that tonight was kind of like a dance club. They all had to look for parking, but I parked right in front and got to ride home in a rare cool breeze, lucky me. Summertime, you are outdoing yourself. This entry was posted in crowds, museums, safety, tourism and tagged Convention Center, conventions, fire, Harborplace, McCormick Spice Store, Walters Art Museum. Bookmark the permalink. One of the Q members from years ago is a long distance trucker and he was In Baltimore to pick up one of those huge trucks to haul to Washington state. Small world. Heels? That I have to see! Excellent post. I am awestruck by these two sentences: Everyone but me was in an outfit proclaiming their firehouse or their familial relationship with a firefighter, and yet again I was reminded that people are truly, madly, deeply embedded in worlds I know nothing about, thank goodness, because I love the part where there are so many ways to live a life, and sometimes everybody living one life gets to meet up and just revel in it, which they were doing….I can certainly do without the Confederacy crap though. Enjoy this gorgeous weather while it lasts. Lovely to wake up to a cool morning!